This post is sponsored by San Pellegrino’s Fine Dining Lovers and as usual the content is all NOTCOT! 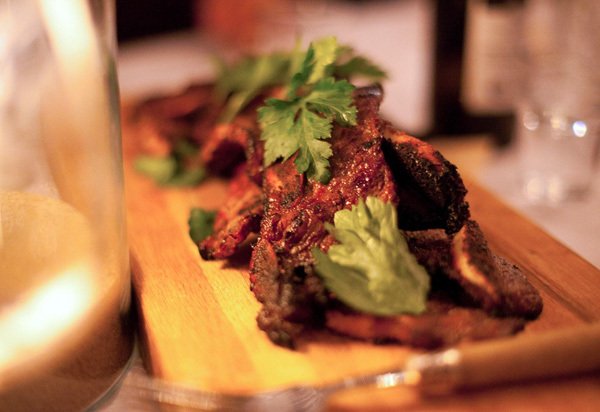 Check out Tasteologie Editor, Jackson’s, adventures in Malibu! Wine makers and connoisseurs often talk of terroir. The taste that the place imparts on the grapes. 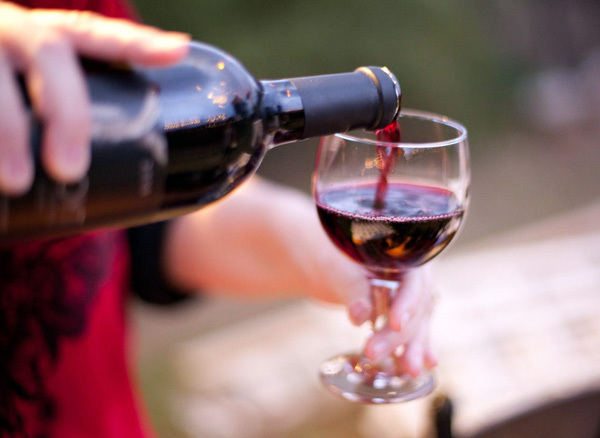 You can close your eyes and taste the soils… the micro climate… get a sense of the life of the wine. 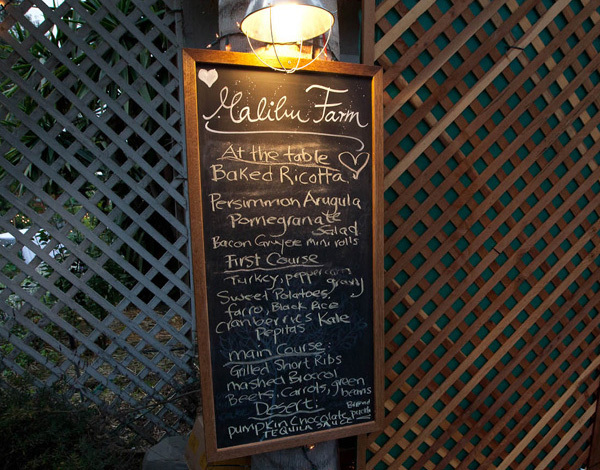 It’s rare that we think of dinners as having the same property, but after meeting Helene and dining at her Malibu Farm. I now know that the an entire dinner can taste and feel of a place. 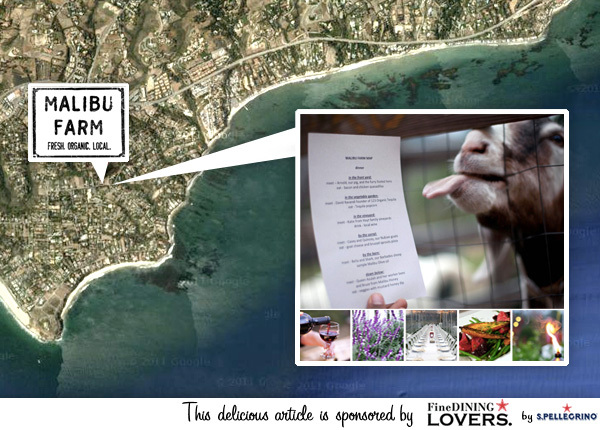 The dinner was delicious and thoroughly Malibu in every sense. 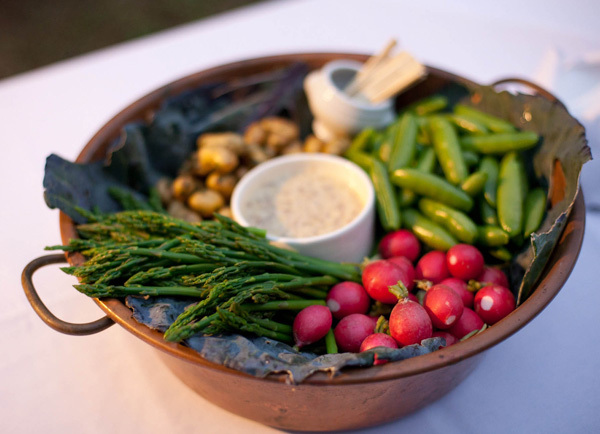 Some of the vegetables were grown on the property, just feet away from where we dined. 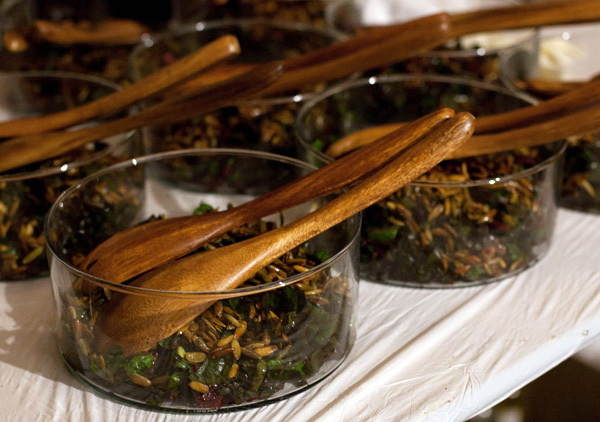 The salads were dotted with pomegranate and the guest list was gently peppered with Hollywood. 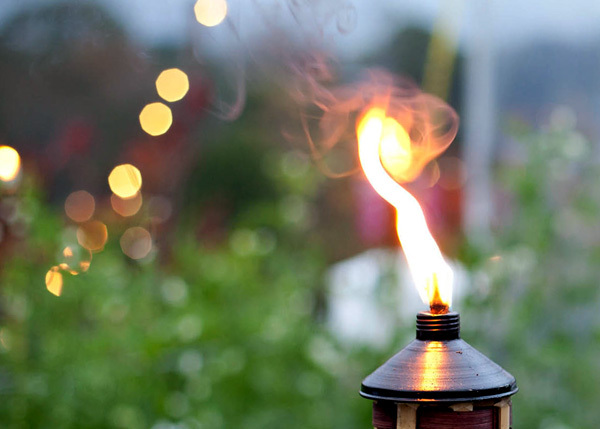 Winter soon brought nightfall but a gently heated tent, a live band, and plenty of local wine kept the party going late into the night. Being so close to the roots of one’s food was an amazing experience and I can’t wait to show you the rest. 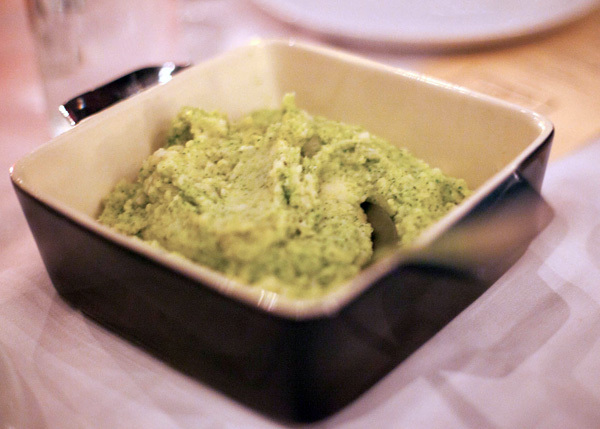 The menu put a focus on fresh simple ingredients, which suited me just fine. 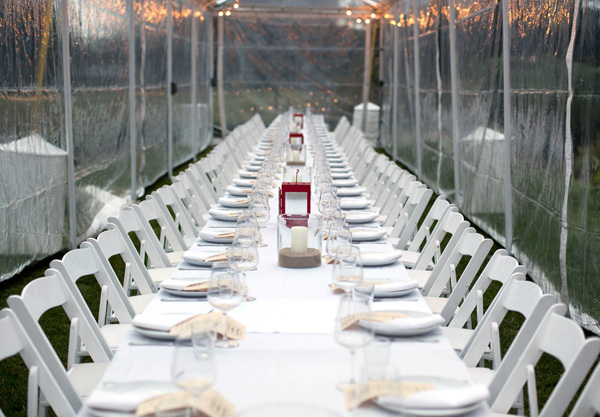 The dinners have evolved from a charity event to benefit a local school into ambitious culinary affairs. Everything has a lovely homey feel to it…. 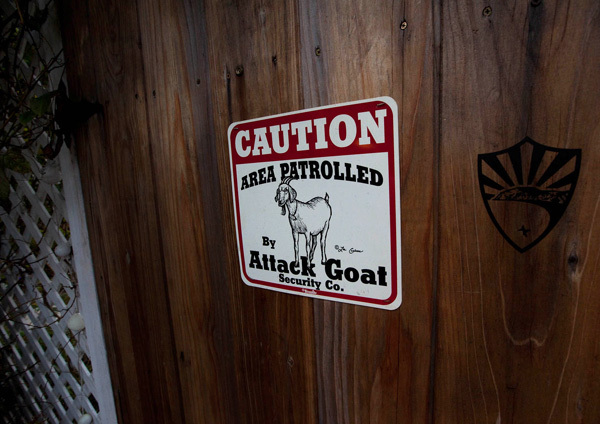 after all the hosts do live on the farm. The entire experience, from their teenaged son playing in the band, to eating literally in their backyard, feels more like a party at a friend’s house than a formal dinner. Especially if you had a friend with a farm who had worked as a professional chef. Even the local wildlife wanted a taste. None of these animals were harmed in the making of dinner. In fact they proved to be quite professional entertainers. Arnold, the pig, was quite charming, even as guest ate bacon quesadillas in front of him. Dinner started with a wine and appetizer hour. 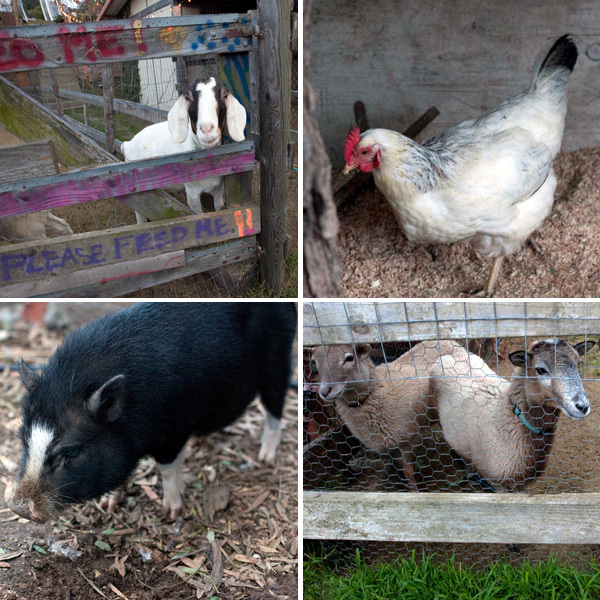 Everything was spread about their farm in a sort of scavenger hunt. There were tables set up with small bites and various treats to try. There was a strong emphasis on local, like with this wine which came from a vineyard in Malibu. 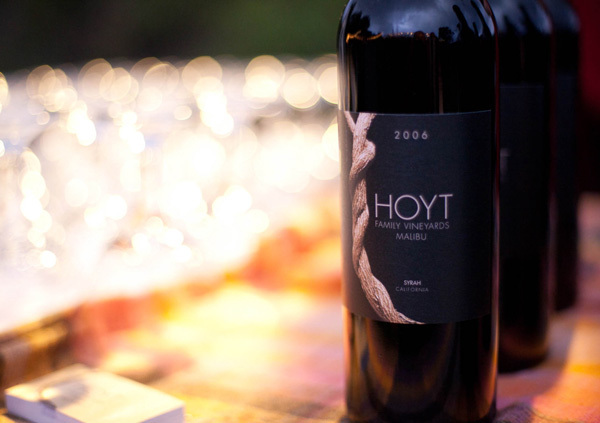 Hoyt Vineyards supplied the wine including their lovely 2008 Cabernet Sauvignon. It was full of big fruity taste and drank well while wandering about the farm on the hillside. The farm was gorgeous with something new to see and photograph at every turn. 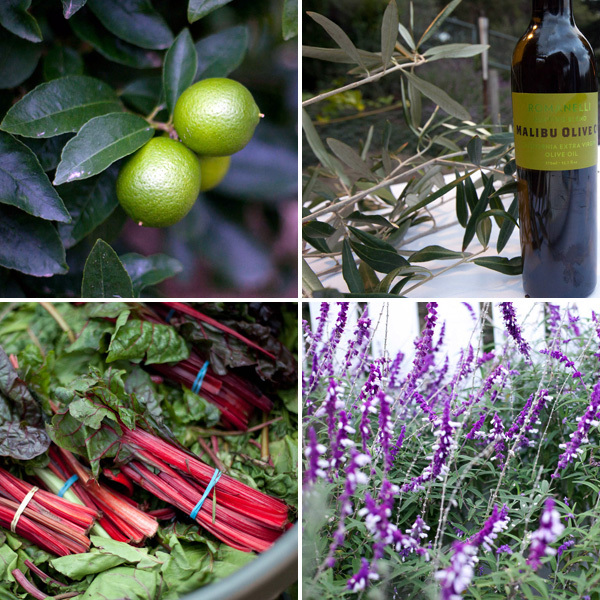 From the beautiful chard, which was on hand for guests to feed the goats, to a tasty locally pressed olive oil from Malibu Olive Oil Company. 1 2 3 Tequila offered up tastings from their line of organic tequilas. Their Number 1, a blanco, is amazingly smooth… it has all the bright flavors you want from a good sipping tequila with a minimal burn. 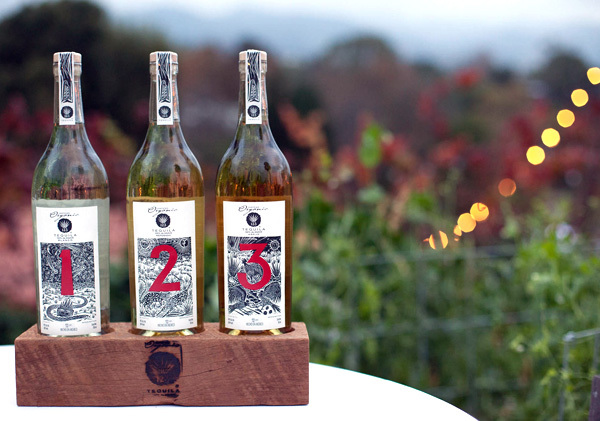 Their 3, an añejo, is full of great smokey agave flavor and a wonderful woodiness from its year spent in oak barrels. This entire basket was from the Malibu Farm itself. The sugar snap peas were amazing… they were enormous and a joy to eat straight out of the garden. The sun faded and the grill was lit. 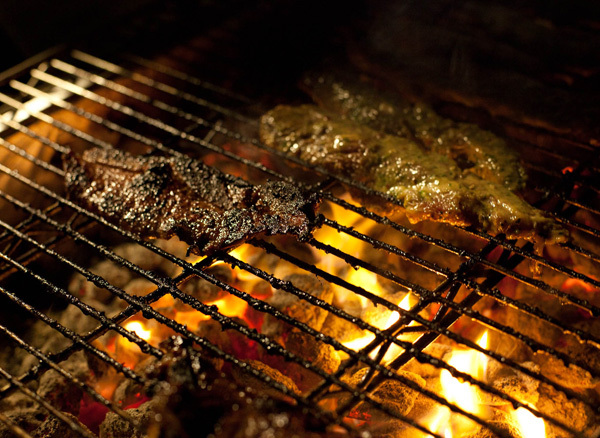 A team of pit masters kept the short ribs moving across the hot coals. 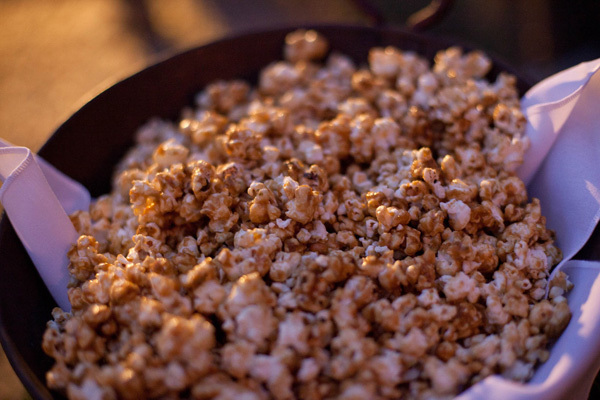 This caramel corn was flavored with lime. The result was something which moved deliciously between sweet, sour, and salty. One of the guests noted that it reminded him of Trix children’s cereal, and once I heard that I could hardly taste anything else! The food was rustic, but came in an amazing variety and abundance. 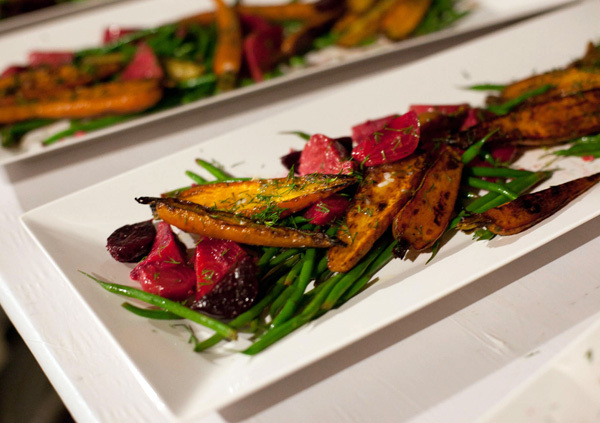 The dishes tended towards colorful combinations of flavorful ingredients like this salad with carrots and beets. 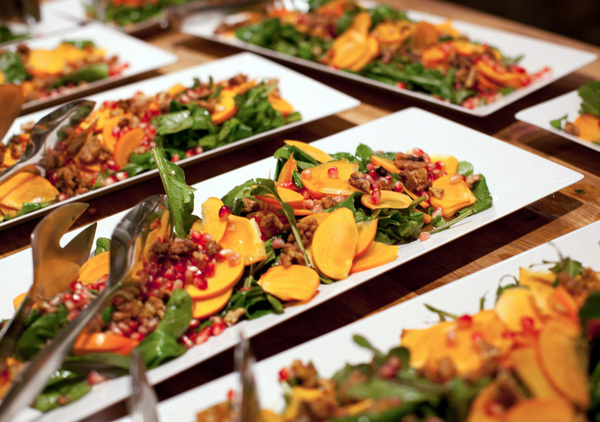 There was another salad of thin sliced persimmons and arugula. The sweetness and bitterness of the dish played perfectly off each other. It left my taste buds thoroughly engaged while still remaining light and leaving room for the rest. The fresh veggies kept coming… the meal managed somehow to be both sumptuous and healthy at the same time. There were 3 salads in all… which left plenty of room for the short rib main course. The short ribs were amazing. They had a lovely sear from their time on the grill and were seasoned wonderfully. This was especially impressive considering the chef doesn’t eat red meat, and had to rely on a interpreting a combination of enthusiastic grunts from a pack of teenagers to fine tune the recipe. 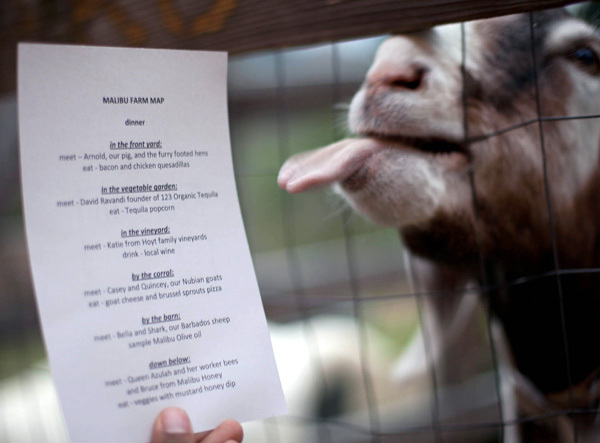 The farm is guarded by not just the goats, but by an exclusive clientele enthusiastically spreading the gospel of Malibu Farm by word of mouth. Many of the guests I’d talked to were from the area and had heard about the dinner from friends. Locals eating local sets a fantastic example for a new form of agriculture and dining… matching wonderful guests, ingredients, producers (both of the food and the film kind), and enthusiasm for a fantastic experience. This was by, from, and, for Malibu… and tasted every bit of it.